In this module, you can configure a Form application so that it can use Stored Procedures (defined in the Database) in the Insert, Update and Delete operations. It is not necessary to use the three options simultaneously, in a way that the options that are not configured to use Procedures continue to work as ScriptCase’s default that are the commands INSERT, UPDATE and DELETE. See below, the step-by-step to implement a Stored Procedure to insert into the Database. 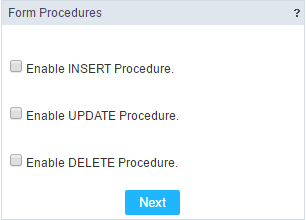 Let check the first option: “Enable INSERT Procedure”. 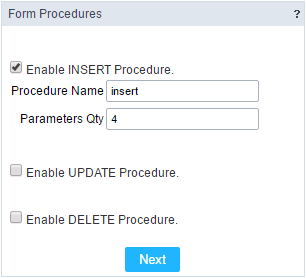 Next inform the Name of the Procedure the number of parameters. Defining parameters for the Procedure. 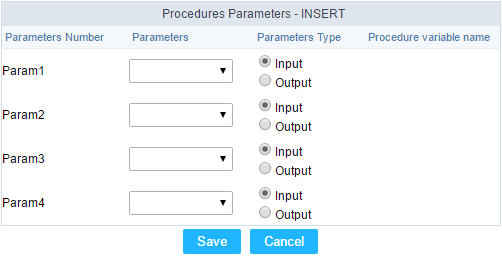 Now define the fields that will reference each parameter of the Stored Procedure, as the type of parameter (Input or Output). Next click on the button save to finish the process. Passing value to the Stored Procedure Parameters.